good nutrients are added. When we substituted the egg we saved ourselves 80 calories of fat, and 340 mg of cholesterol! 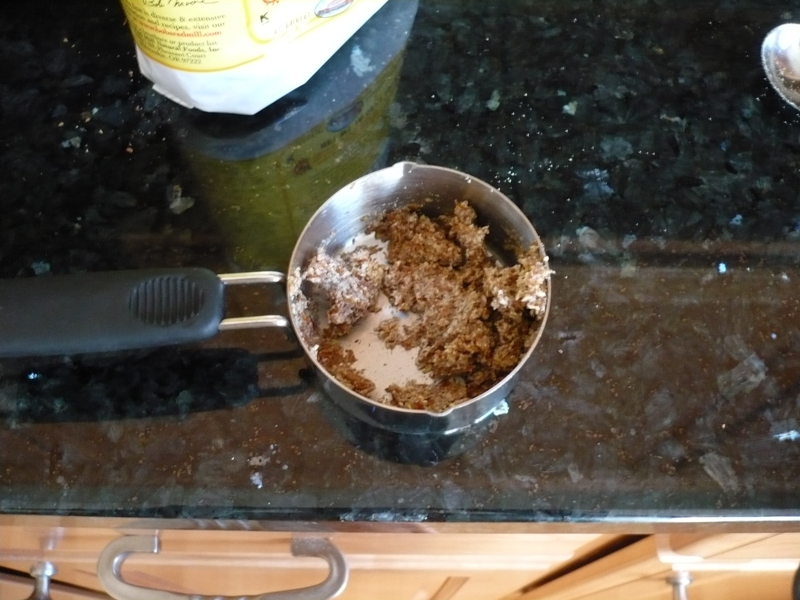 (The flax seed mixture has no cholesterol in it at all.) 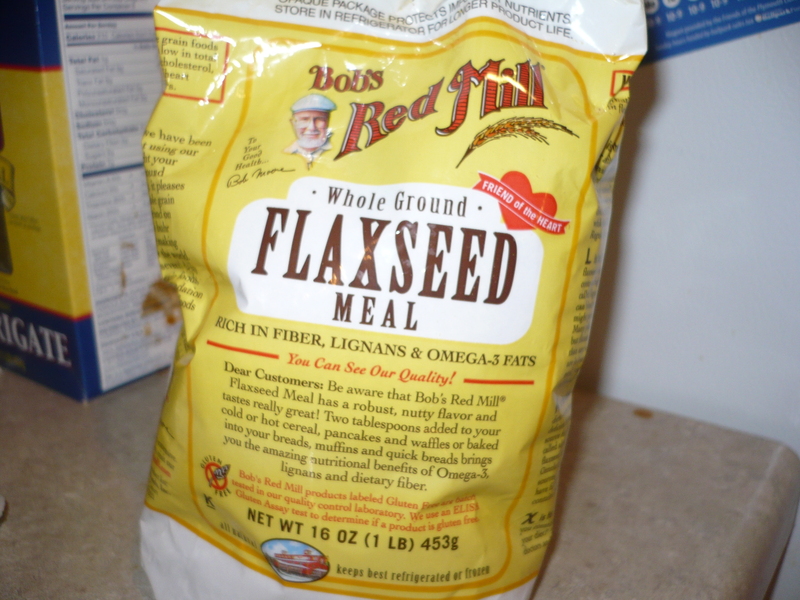 Plus like I have mentioned before in previous postings, flaxseed is really good for you. It contains a lot of fiber, lignans (which are natural antioxidants) and omega 3 fats. Not only did the flaxseed have no cholesterol but it also has been proven that flaxseed lowers harmful cholesterol already in your body. 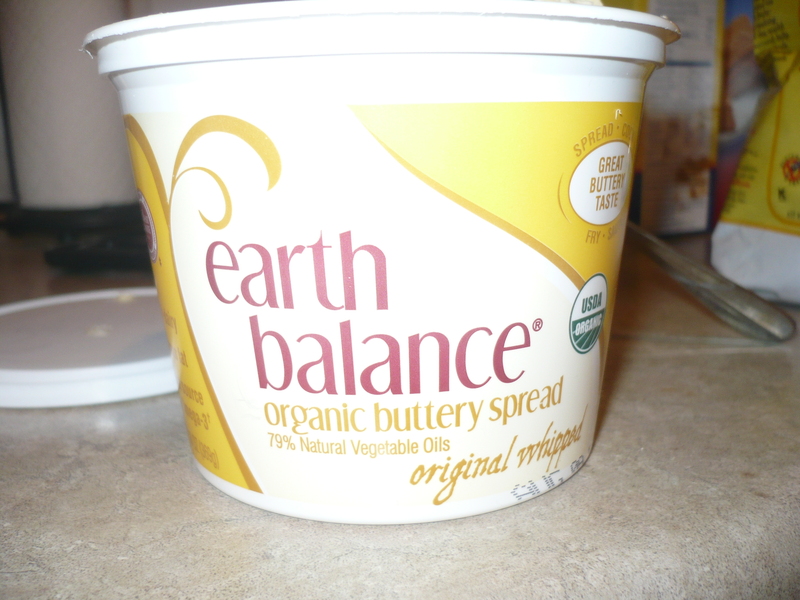 And obviously substituting anything for butter is going to be healthier. for taste, it’s just used as a binder. My husband ate the brownies and he definitely could not taste a difference. 1. Heat over to 325 degrees. Grease your pan. 2. 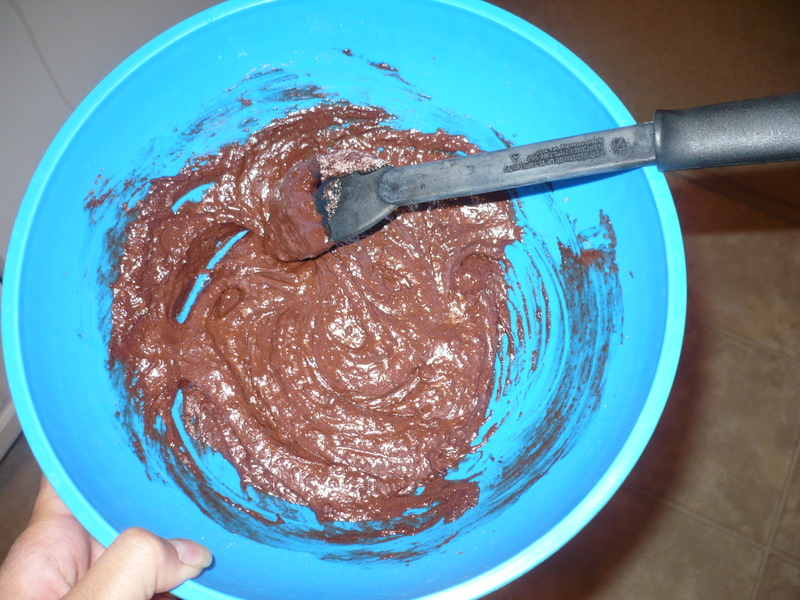 Stir the brownie mix with 2 tbsp water, melted spread and flax seed egg substitute in a bowl until well blended. Spread in pan. 3. 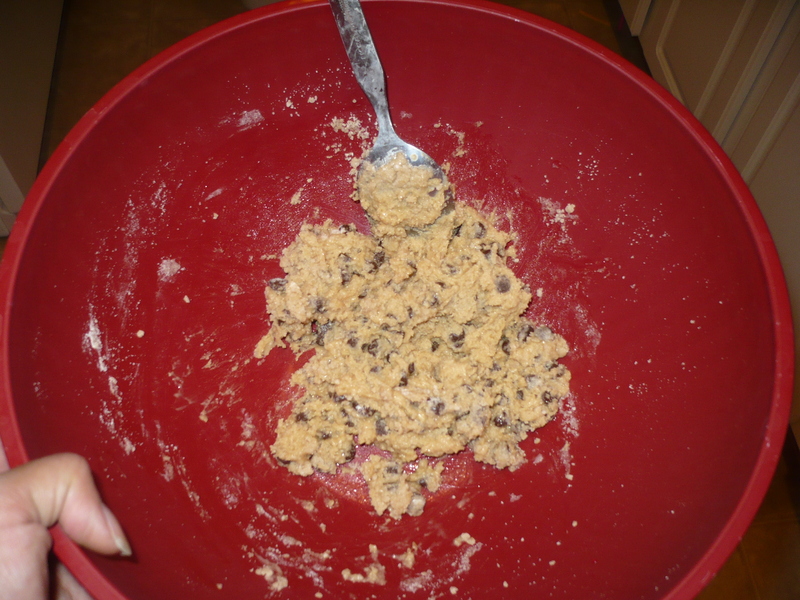 Stir the cookie dough batter with the tbsp water and softened spread. 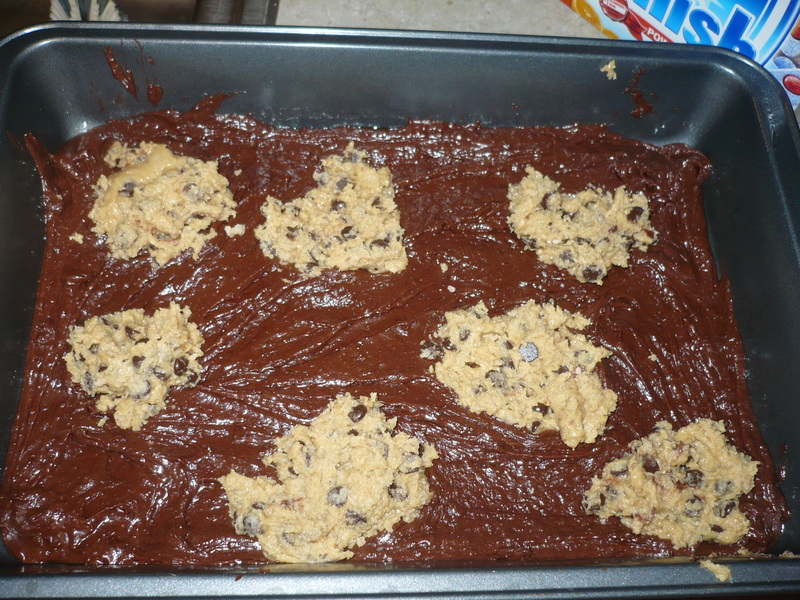 Once a dough forms, drop teaspoons (or chunks like I did) onto the brownie batter. I would even check it before the suggested time, just to be sure. Also follow directions. The first time I made this I used a 13″ x 9″ for 35 mins because thats what it said on the box – however I used a dark pan – and ended up making a nice brick. Sigh. It was pretty devastating. My whole house smelled like fresh treats, but there were none to enjoy since biting into the brownie may have cracked my teeth. So you already know I am frugal. So today I attempted to make a cheap vegan cupcake. I love doing things as cheap as possible, but due to my laziness I also love it when they are easy on top of it! 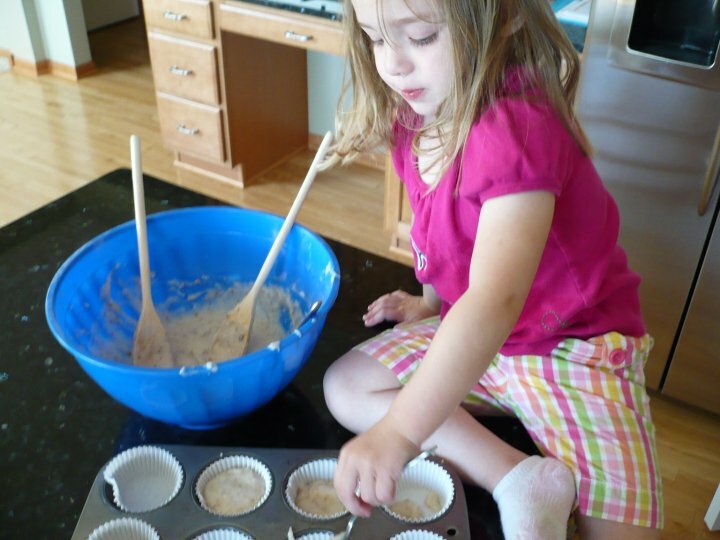 A lot of vegan cupcake recipes I have read involve too many ingredients for me or involve too much time. 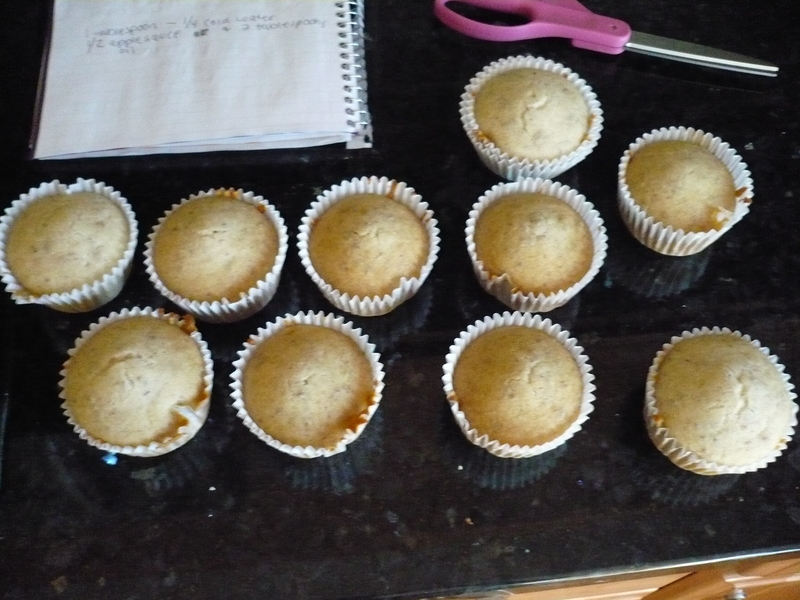 I found a very simple way to make vegan cupcakes and what is great about them is that they cut so many calories, cholesterol and other bad things that anyone, vegan or not, will appreciate them! On top of that it took close to no time at all to make! I’d say the whole thing, including baking time only took 20 minutes. 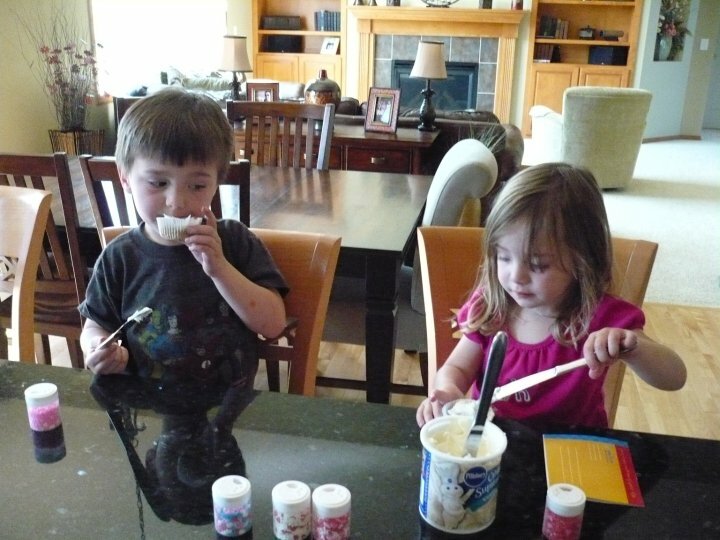 My helpers and also taste testers were the two lovely children that I nanny. 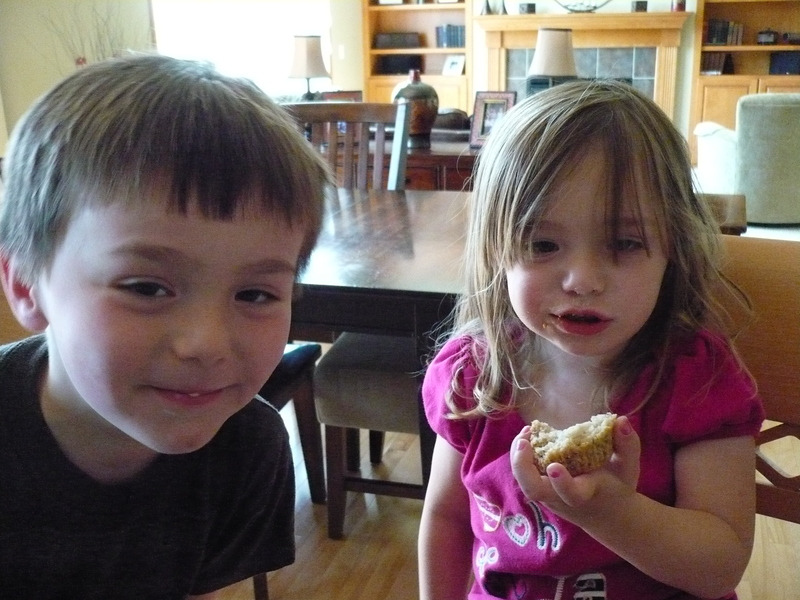 These two kids do not eat anything. 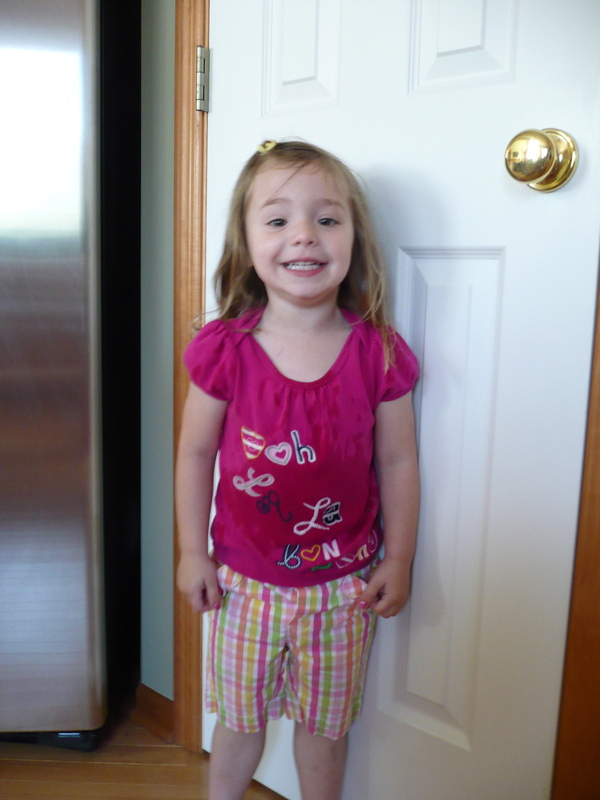 They don’t consume enough nutritional food in their diets and also have way too much sweets. They are beyond picky and do not have any variety in what they eat. In my eyes? 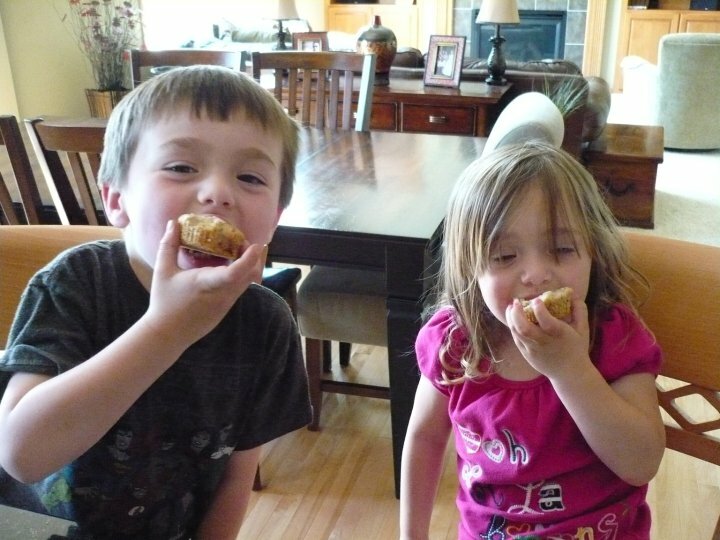 Perfect taste testers! To be as simple/lazy as possible I used whatever I could that was already in the house. And you can do that too. I think if I were to become some cupcake artist I would probably look into more natural ingredients and find different products. But as I’ve said this was made without any additional purchases! Very frugal! 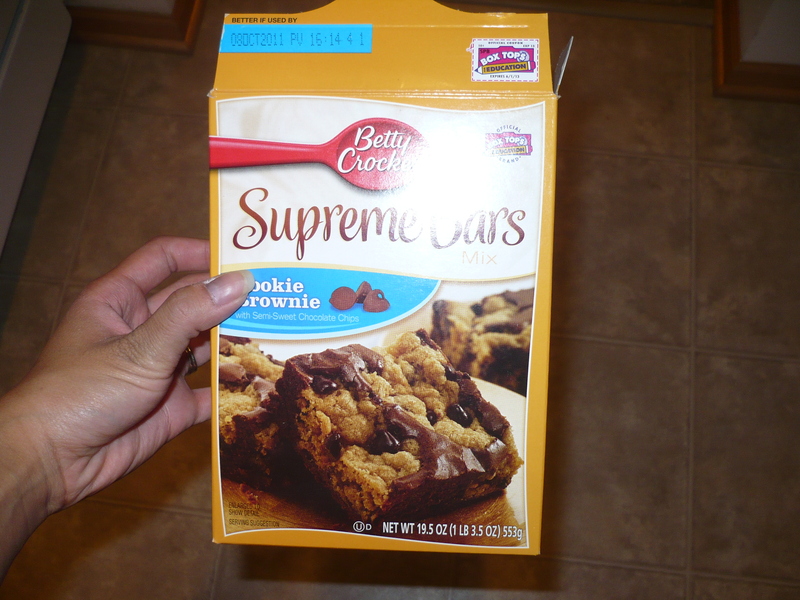 Betty Crocker Gluten Free Cake Mix (Yellow) -We had this in the pantry and I decided this would work just fine. It also happens to be vegan! The original recipe on the back of the box requires a full stick of butter, vanilla and three eggs, and those are the things that I substituted in my version. Whole Ground Flaxseed -Any brand will do. 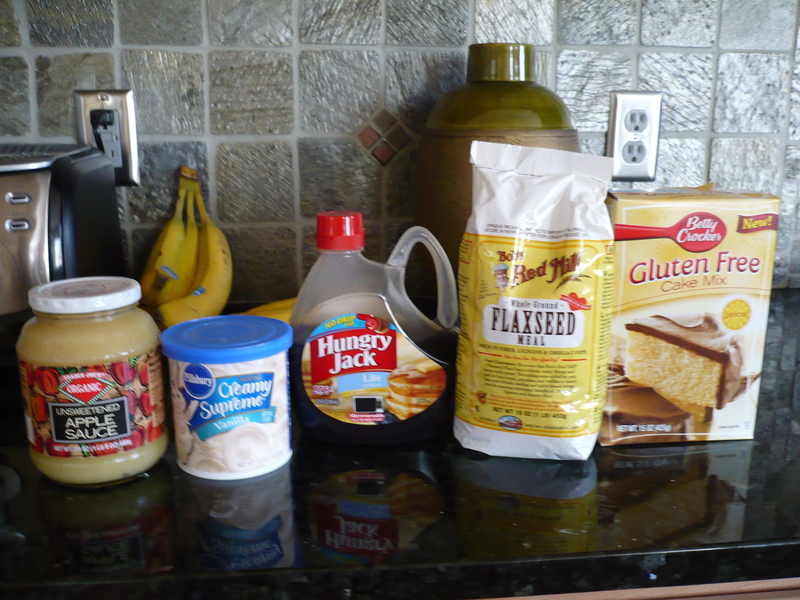 This replaces the eggs by being a binder in the mixture to keep the cake from crumbling. It’s also full of great things that I will mention later on. Hungry Jack Lite Syrup -If I had my choice I would have gotten organic maple syrup but since we had this I went for it. At least it is Lite! 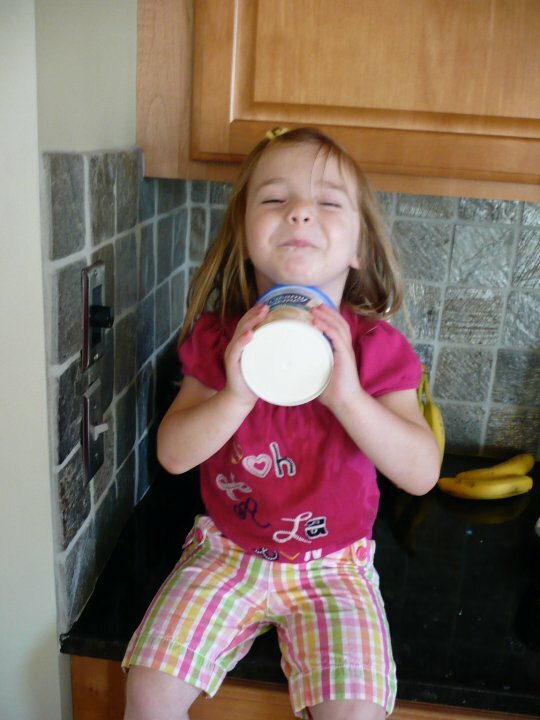 Organic Unsweetened Apple Sauce -You can really use any brand of apple sauce. Canola Oil -If you don’t have it, vegetable oil will work too. 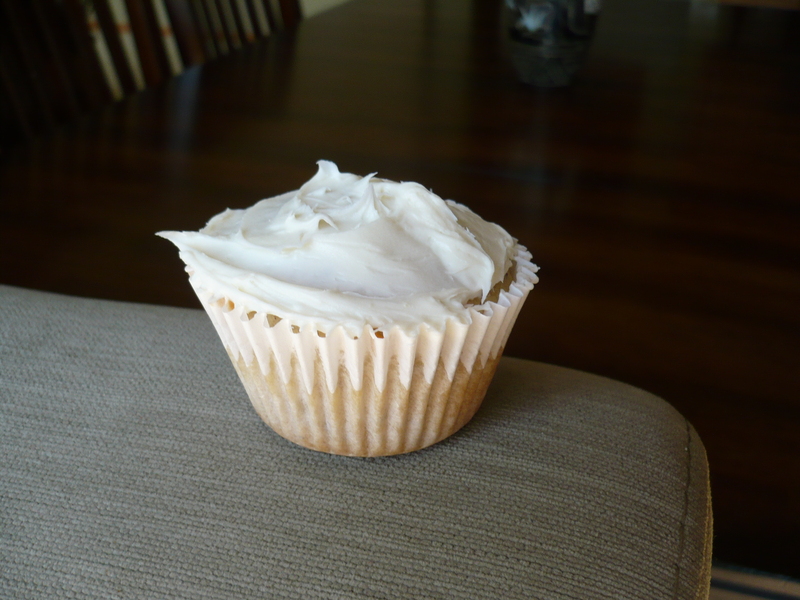 We had Pillsbury Creamy Supreme Vanilla frosting which is deadly but I cut the servings in half and saved 75 calories per cupcake. And this brand is vegan! 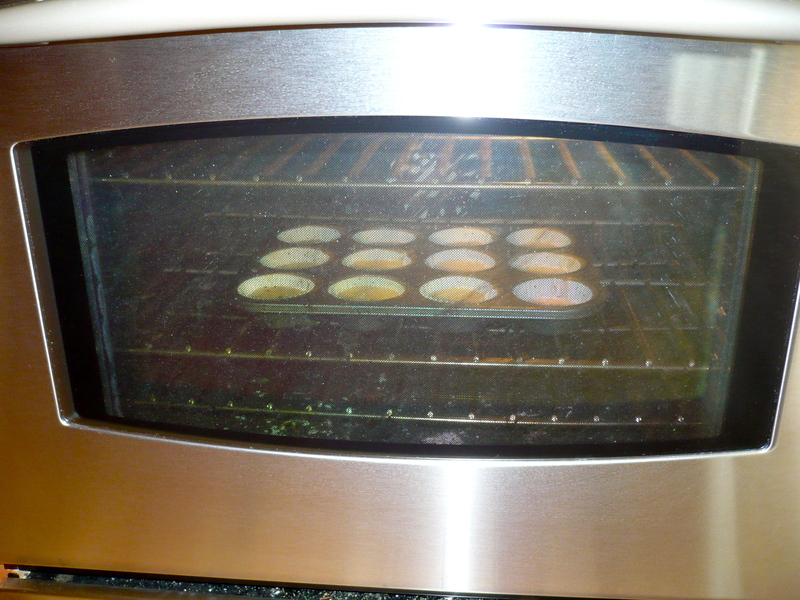 Heat oven to 350 degrees and grease your pan (for cake) or use paper baking cups for 12 cupcakes. 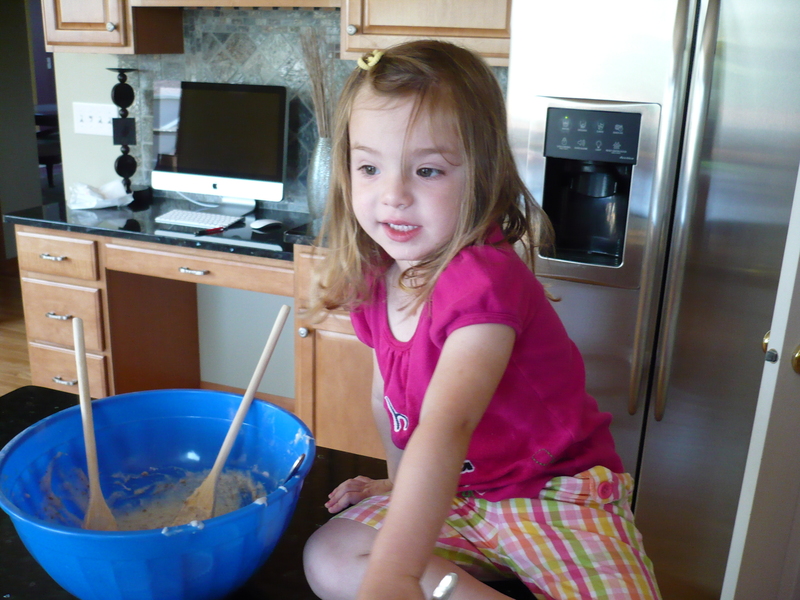 You can hand beat the cake mix, water, flaxseed mixture, maple syrup, canola oil and apple sauce until all the lumps are gone. Pour into your pan. Bake! 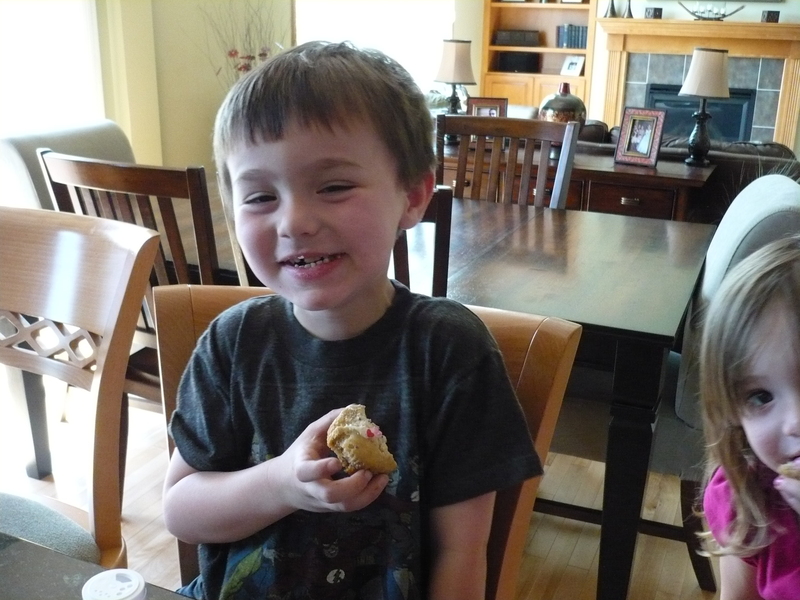 Remember to test your cupcakes with a tooth pick to make sure it was cooked all the way! 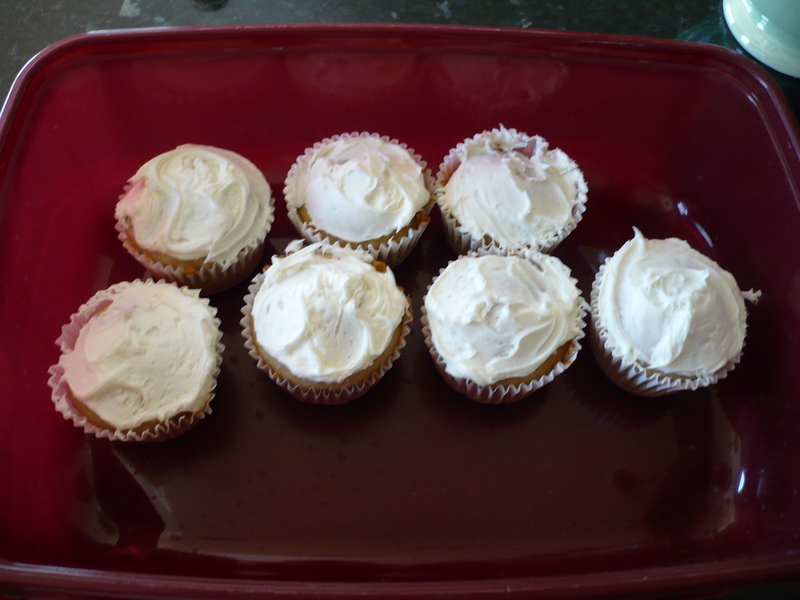 12 cupcakes: roughly 20 minutes. 9” round pan: roughly 43 minutes. 9” x 9”: roughly 35 minutes. 8” x 8”: roughly 38 minutes. Easy isn’t it? And the great thing was they were super healthy! 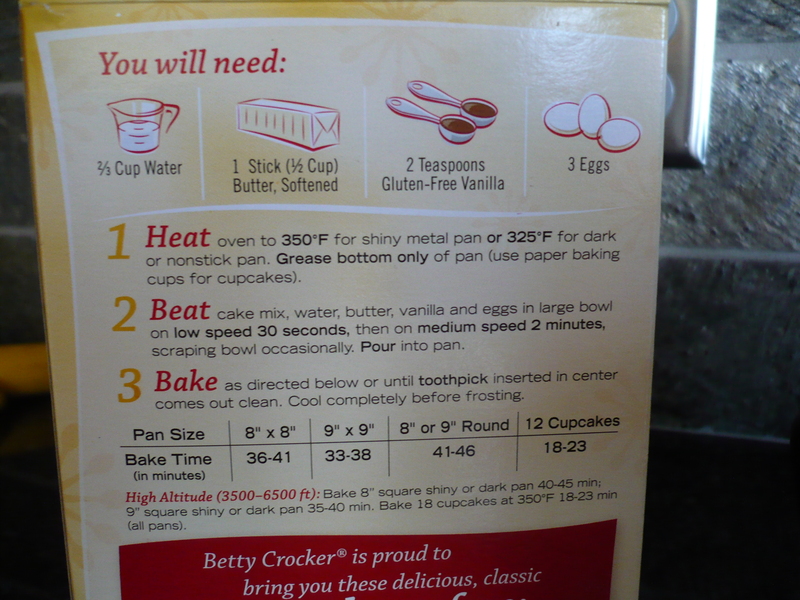 In this version the cake mix itself contributed less than 250 calories per cupcake and 0% cholesterol. The serving of frosting I cut in half, saving us 75 calories. Here’s a whopper; If we had used the stick of butter that would have been 810 calories and 92 grams of fat! 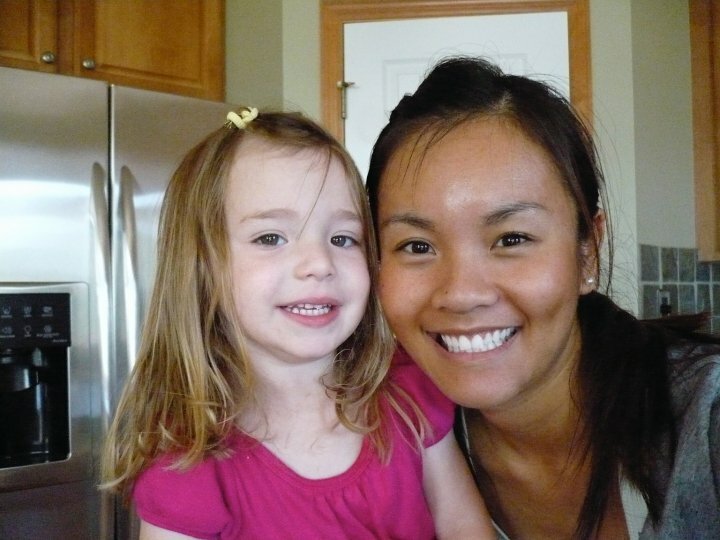 Since we used applesauce and a dash of oil we only had 130 calories and 10 grams of fat! Holy smokes. When we substituted the eggs we saved 330 calories and 1020mg of cholesterol! Using the flaxseed we only had 90 calories and 0 cholesterol! As if that wasn’t good enough flaxseed contains lots of fiber, (only 4 grams of flaxseed is equal to 1-1/2 cups of oatmeal! Only 4 grams! We used 20 grams!) lignans, (which are natural antioxidants! Its like we ate 30 cups of broccoli!) and omega-3 fats. Not only did the flaxseed have no cholesterol but it also has been proven that flaxseed lowers harmful cholesterol already in your body. How super is all that? The kids knew no different. They loved it! 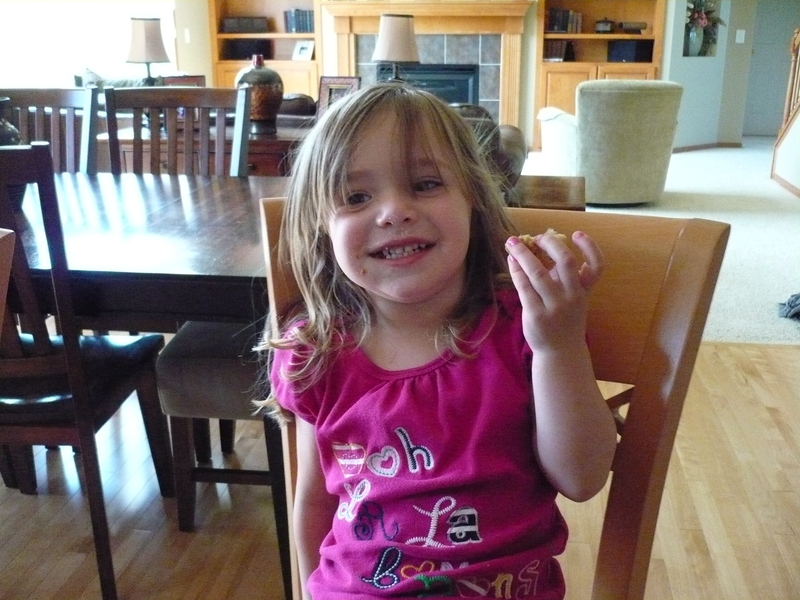 Both kids devoured their cupcakes! I also liked it. This cake was a little more dense than a regular yellow cake, so it almost tasted like a muffin. I think next time I would even get rid of the frosting altogether and use an organic strawberry or raspberry jam! Try it for yourself or come up with another variation! It’s fun! Flaxseed + Water should look like this. 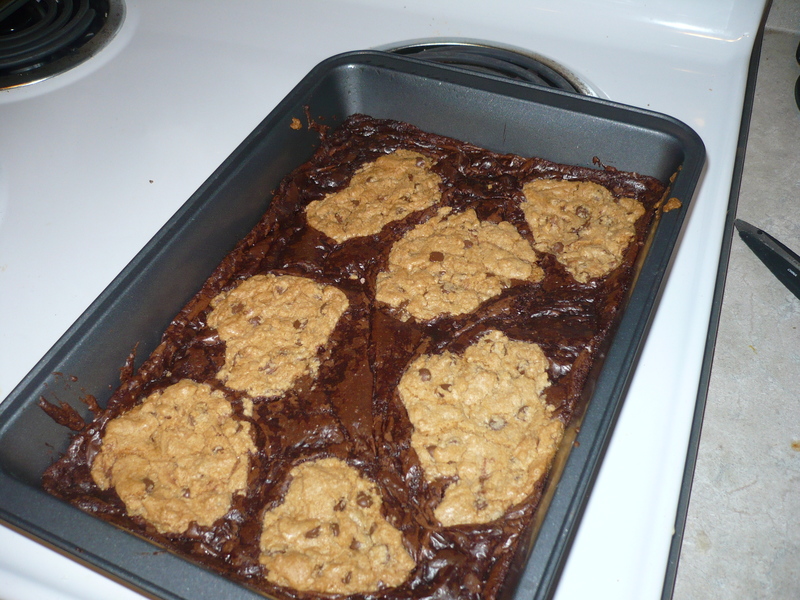 Kind of gooey and clumpy. Diego and Dora had to have sprinkles.